Prick skin of the duck. Lower duck into water and boil for about 2 minutes. Remove and pat dry with paper towel. Loosen the skin of the duck with fingers and back of a wooden spoon – careful not to tear the skin. In a saucepan bring lemon juice, honey, soya sauce, Shaoxing rice wine (sherry) 5 spice powder, ginger and hoisin sauce to a boil. Remove from heat and spoon over the duck, under the skin, and inside the duck. Leave duck to hang in airy space for 5 hours, or leave uncovered in the fridge. Chop up spring onion, garlic, and ginger and insert in the cavity of the duck. Tie legs and secure wings. Place duck on a roasting rack over roasting pan and roast in preheated oven at 180C for 45 minutes. Turn and roast for another hour 45 minutes till crispy and golden. Serve with mandarin pancakes, finely julienned cucumber (deseeded) and carrot and shredded spring onions, and plum sauce. Place flour in a bowl, add boiling water mixing slowly. Knead and leave for 1 hour. Knead again until elastic and smooth. Roll and divide into 16 balls. Place on a floured board and flatten with palm of hand into a disc shape. Brush 8 of the discs sesame oil. Add another disc on top and flatten and join circles with oil on the inside. Roll out again till a thin pancake is formed. Fry in hot wok till bubbles form about 1 minute then turn for about 30 seconds. When cool, carefully separate into 2 pancakes. 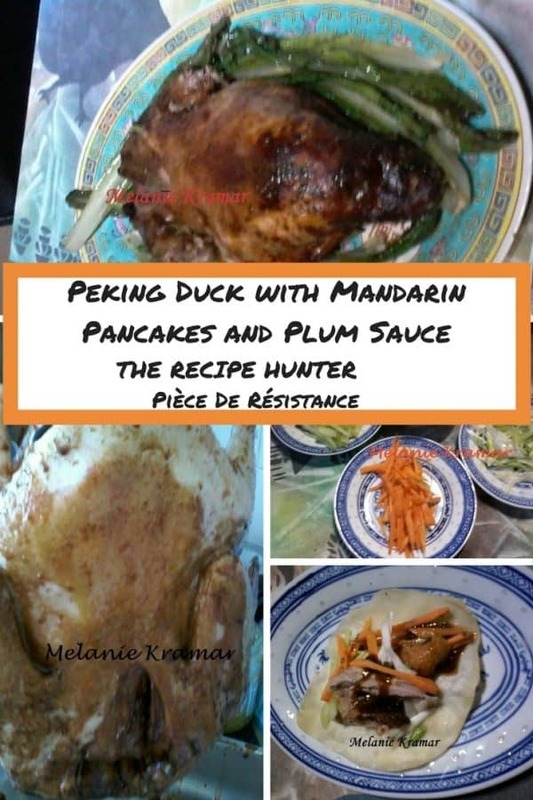 Place plum sauce in center of the pancake, add cucumber and carrot, and crispy skin and duck meat, add shredded spring onion and some more sauce. This was thoroughly enjoyed by hubby! Sounds DELICIOUS! I’ve never attempted Peking Duck because it always seemed so time consuming.. I’m definitely going to have to give this one a try. It doesn’t seem too daunting! Yes I see quite a bit of work on this one, but it does sound awesome.